At Zejtun there is a Christmas mechanical crib which is 65 years old which has attracted many tourists and Maltese over these years. It depicts the story of the nativity of our lord including others scenes from the five Joyful Mysteries of the Holy Rosary. It has become a tradition that many keep on going year after year even until their children start growing, helping them visualizing the story and culture of the nativity scene apart from the religious aspect of the story. The crib is located at the Institute and orphanage of Jesus of Nazareth in Bishop Emmanuel Galea Street, Zejtun in the south of Malta. It was created by the late Bishop Emmanuel Galea who at the time was the director. He gave a home to hundreds of bereaved children. Back to 1947 Bishop Emmanuel Galea had a wish to create a large crib recreating the nativity of the Christ Jesus. He himself did the works to create it and opened it for public viewing during the same Christmas up to where he had completed. He had asked for help from Paul Pavia of Zejtun to work on the mechanization of the crib figures. The Institute's sisters sewed all the clothes for each figure. The crib was completed after several years of works until it reached the present size. The nativity story depicts the following scenes in the Christmas mechanical crib. The central window shows the majority of the scenes. The birth of Jesus in the Bethlehem grotto. The three Wise Men and several shepherds adore the newly born Divine Child. The three windows opens upon the scene of the presentation of the Child Jesus in the temple of Jerusalem. Mary and St. Joseph holding her child in her arms are depicted fleeing to Egypt on a donkey. The Angel Gabriel announcing the birth of Jesus to the Virgin Mary is displayed in the forefront. In the background Our Lady is depicted meeting her cousin Elizabeth. The crib was constructed during 1947. The second world war had just passed by and the hardship of the Maltese at the time was very strong. So imagining to what difficulty it was to find the materials and funds to do the mammoth task. In fact the materials used were newspaper and glue, whole wooden doors and various pieces of assorted wood. 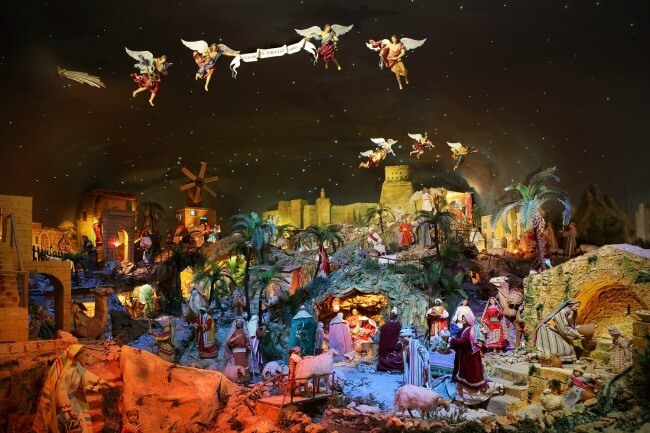 The mechanical section was entrusted to a Zejtun resident Paul Pavia who in such a clever way succeeded to operate all the figures of the crib. With just one motor, which was attached to a multitude of nylon strings, were made to function by means of different sizes of pulleys, old bicycle chains which were very common at the time and cinema film reels. All located at various strategically positioned underneath the crib connected to the many figures exhibited in the crib. All movements were according to the representation of the figure. All this apart from creating the ingenious way to create the figurines movements made from wood and iron wire which at the time was even more difficult s one had to be very creative due to lack of materials and funds. Presently it is being renovated as over the years many parts started deteriorating. Presently the nephew of Paul Pavia is working on the intensive restoration. It is worth a visit and if you do not know the way there will be no problem to arrive as everyone knows about it. The Christmas mechanical crib opens to the public from around mid-December until 4th January. Opening hours are 9.30 am to 12.00 and 4.00 to 7.00 pm. To contact: +356 2167 4498. Address of the orphanage: Jesus of Nazareth Sisters, 51, Triq San Girgor, Zejtun.